In his book ‘India after Gandhi’, noted historian Ramchandra Guha describes Jantar Mantar as “mini India”. On Tuesday, this “mini India” was painted blue. 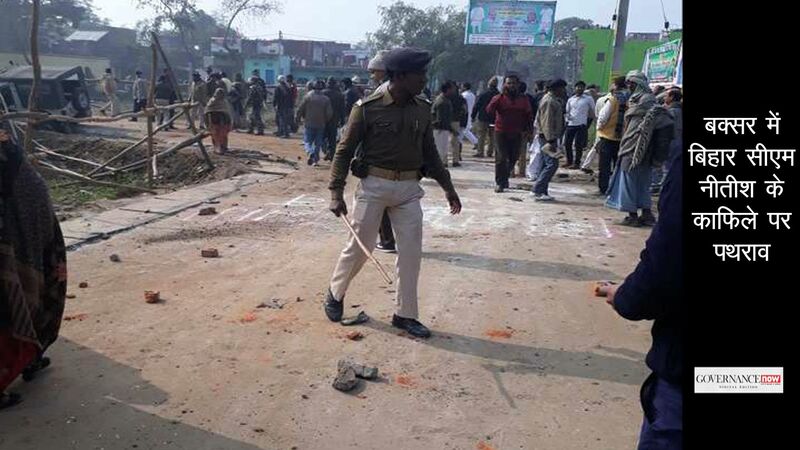 Shouting slogans of “Jai Bhim”, more than 5,000 people, including students and teachers, were waving blue flags at the protest site. They were participating in a ‘Chalo Delhi’ rally organised by the Joint Action Committee for Social Justice (JACSJ) of University of Hyderabad. Some had even come from Andhra Pradesh and Kerala to join the rally in New Delhi. Around 2,000 students from the Jawaharlal Nehru University (JNU) lend their support to the JACSJ and marched from Jhandewalan to Jantar Mantar. Wearing headbands with ‘CastOutCaste’ written on it, students from Jamia Milia Islamia, Anna Malai University, Film and Television Institute of India (FTII), Calicut University, IIT-Bombay, University of Delhi and a few institutions of Ghaziabad and Noida were marching in large numbers. All of them stood united to voice their dissent with the recent events in the campuses of University of Hyderabad, JNU, FTII Pune, IIT-Madras and Banaras Hindu University. 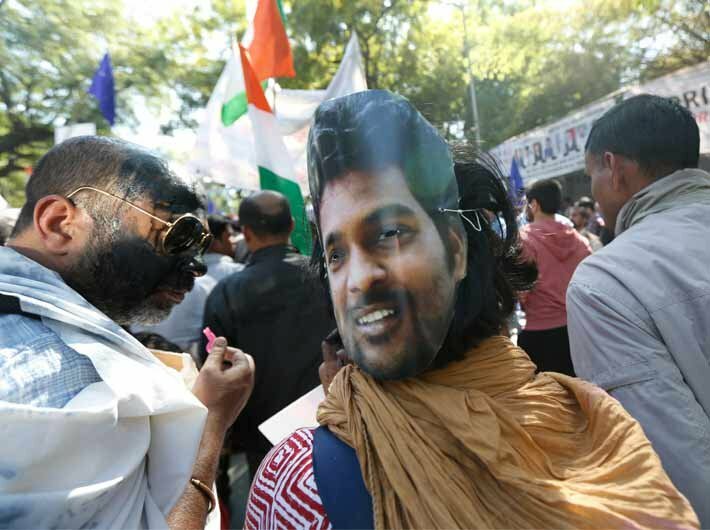 It was difficult to distinguish whether they were protesting for Rohith Vemula, or Umar Khalid or Kanhaiya Kumar. Performance artist Inder Salim turned up wearing a fluffy red heart pinned on his shirt and distributed whistles to the marchers. “Think with your heart,” he urged softly, hopeful that his voice would travel far enough. Students from Delhi College of Engineering were selling T-shirts with Vemula’s sketch printed on them. Street artists, theatre actors, and painters were also participating in the rally which culminated into a small congregation at Jantar Mantar. The site was already buzzing with 15 other protest gatherings organized under different banners. Sudhanshu, a PhD student from JNU, said, “They will have to listen. We will initiate the agitation in all institutions. We will conduct nationalism classes in other places as well so as to spread the real definition of nationalism.” He did not reveal his full name as he wanted to stick to the message of ‘CastOutCaste’. Reciting poems of freedom and struggle, a group of students from Jamia Milia Islamia, led by Ajmal, waved placards of “Annihilate caste uproot Brahminism”. As the students agitated against the caste discrimination in universities, one could hear voices from a nearby stage demanding reservation under OBC quota. These voices were raised by Patel Navnirman Sena. Even mothers of some students had come forward to raise their voices. “We do not allow young people to debate. This will dismantle the meaning of human beings. If we do not debate and dissent, we are human deads, we do not exist,” said a mother of a former JNU student. The protest ground soon turned into a political spectacle as politicians from opposition parties grabbed the opportunity to hog some limelight. The stage from where Chalo Delhi rally was being addressed also witnessed several politicians from the opposition parties including CPI (M) general secretary Sitaram Yechury, senior CPI leader Brinda Karat, Congress vice-president Rahul Gandhi, and Delhi CM Arvind Kejriwal. “We need a law which doesn’t let students’ voices in colleges and universities be crushed. I spoke about this in Hyderabad and we’re discussing this in the Congress party,” said Rahul Gandhi hitting out at the centre for attempting to force down one ideology among the masses. Echoing the chant of “Jai Bhim”, Delhi chief minister Arvind Kejriwal said that it is important for the government to pass the ‘Rohith Bill’ that seeks to prevent suicides of ST, SC, OBCs and minority students in universities. “I had said earlier, ‘Modiji, students se pange mat lena’ [don’t mess with students]. Otherwise, they will rock your government and you won’t have a clue,” said Kejriwal. As the blame game between the political parties continued one sensible voice emerged from the cacophony. 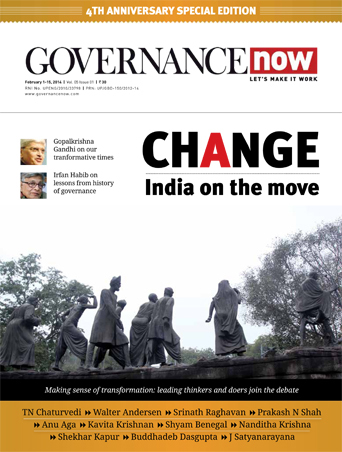 Former member of University Grants Commission (UGC) and Swaraj Abhiyan founder, Yogendra Yadav, said that most academic institutions do not follow important recommendations like the UGC (promotion of equity in higher education institutions) Regulation 2012 and UGC (Grievance Redressal) Regulations 2012. “The regulations insist on selecting an anti-discrimination officer and an ombudsperson to settle any grievances including that related to discrimination against SC/ST persons,” he added.